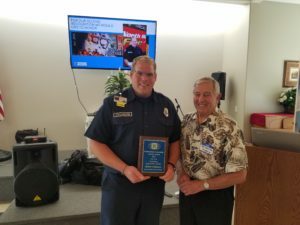 Joined by volunteer and career members of the Fire Authority and his parents, Community Outreach Coordinator, Robert Collamore was presented with an award for Outstanding Service by members of the North Mason Kiwanis during today’s North Mason Chamber membership meeting held at The HUB Senior Center, Belfair. 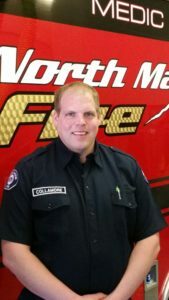 Collamore has been with the Fire Authority since April of this year and has made a tremendous impact to our organization through his work with our Community Response Team (CRT) members. Today’s award commended Collamore for his actions on a particularly challenging call over the summer where a women’s body was found floating in the Hood Canal. Collamore was first on scene and after assessing the situation commandeered a boat to bring the woman ashore where he then initiated resuscitation efforts. After twenty minutes of CPR he was able to restart her heart and she was then transported to the hospital for care. At the presentation today he gave credit to his fellow crew members – saying it was a team effort.